Relax in Style it the two most POPULAR Show in Geek History! Games of Thrones Creator George R.R. Martin to appear! Fans packing their cape for Comic Con will compete to be crowned “King” and “Queen” in a “cosplay” contest created by Courtyard by Marriott, featuring author George R.R. Martin, actor Norman Reedus and famed special FX maestro, Greg Nicotero (“The Walking Dead”). The experience will also offer attendees free make-up touch-ups at the hands of a top Hollywood special FX make-up team throughout the convention (July 24 – 27). Enhance Cosplay with Greg Nicotero – Courtyard’s talented team of “Super Hero HQ” prosthetic make-up artists will be allowing Comic Con attendees to undergo make-up treatments, while choosing from existing designs or creating their own custom original. See the Cosplay King and Queen crowned by Norman Reedus – Elite cosplayers will be crowned by Reedus as the King or Queen of Cosplay, as he handpicks winners from a group of finalists selected by Courtyard’s roving judges scouring the scene for top Cosplay attendees. Relax with Martin –The visionary behind the “Game of Thrones” universe, George R.R. 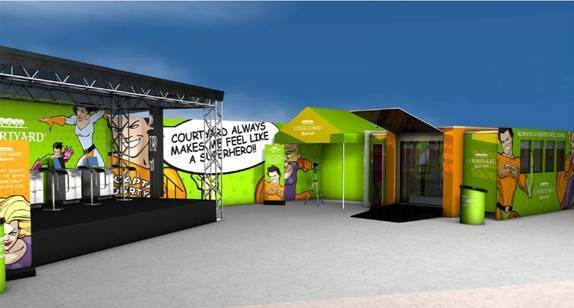 Martin will visit Courtyard’s Super Hero HQ for a public fan Q&A.